We’ve already talked about Jupiter’s liquid metal ocean, but even cooler (and a bit scarier) is the Great Red Spot. With wind speeds reaching over 400 miles per hour, and a surface area that could swallow the Earth twice over, the Great Red Spot is one of the largest storms in the star system. While human beings are capable of surviving wind speeds up to 500 MPH, you still wouldn’t likely last long if you were to find yourself falling into this storm. Imagine, no matter where you went, no matter where the storm carried your body, that all you could see on the horizon was more storm. An endless horizon of crimson. Though the storm has lasted for at least 150 years, (we’ve been seeing a red spot on Jupiter since we first set our telescopes on it in the 1600’s) the immense storm does seem to be weakening, with some scientists saying that it may not even last another ten years. Though, this could merely be a cycle that is completely normal to Jupiter’s storm systems. Time will tell if the Great Red Spot outlasts us all. 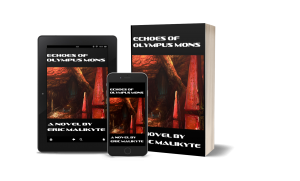 Echoes of Olympus Mons is coming out in just 8 days! You can get the Kindle edition for 25% off by pre-ordering now!